The absolute best way to cook bacon is in an air fryer! It takes only a few minutes and there is no worry of splattering grease getting all over the kitchen. Air fryer bacon cooked perfectly. Not to mention, it is cooks perfectly each and every time! I grew up with memories of my mother cooking bacon in a skillet on the stove. She would warn me to stay away so I didn’t accidentally get burned by the grease that was popping out of the skillet. I would stay in the other room and often hear ‘ouch’ as the grease splattered her has she turned each piece of bacon. 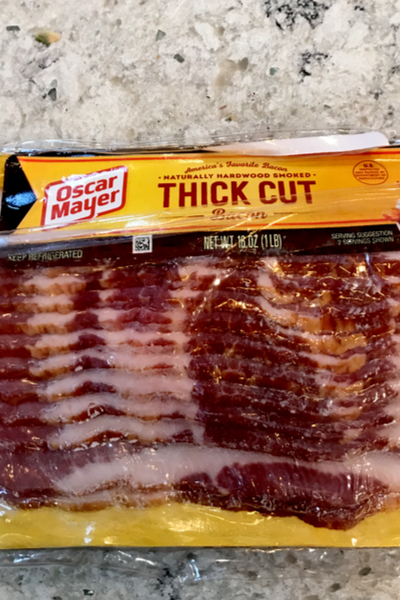 Thick cut bacon ready to be made in the air fryer. She would stand at the stove, cooking in batches, until the entire package was gone. It was easy to make sure the bacon was cooked properly since it was on the stove top. However the ends of the bacon would always curl as it fried in the grease. 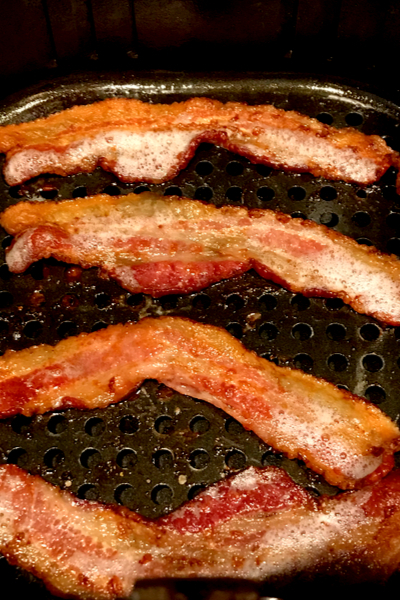 The only way to get flat bacon in a skillet was a bacon press. 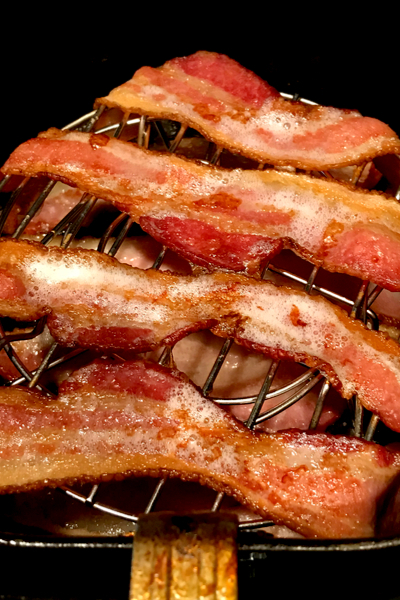 But I found an easier way to make bacon – in the oven! 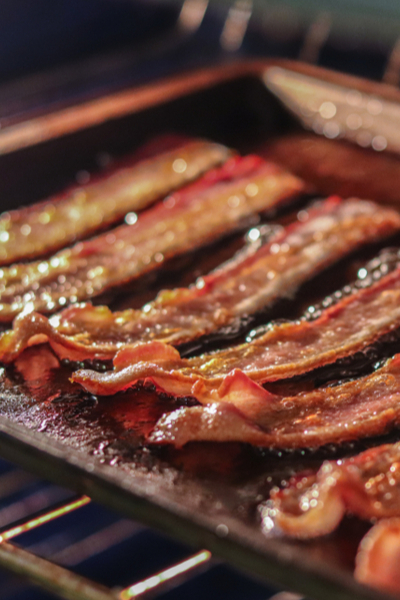 Simply line a whole baking sheet with bacon and every time, each piece of bacon remained nice and flat. I could make an entire package of bacon at once and without the risk of being sprayed by hot grease. I used to cook my bacon in the oven. Now I only use the air fryer. But there were a few downfalls as well to oven baked bacon. I had to line my baking sheet with aluminum foil for easy clean up. Now that might sound like a good thing, but I prefer not to cook my food in foil. And if I didn’t use it, the grease was difficult to clean up. Also, as the bacon cooked in the oven, I would have to closely watch it. It would magically go from not quite cooked to burnt within one minute. This made it difficult to time out when to remove the bacon without a close watch by opening and closing the oven door. And the final downfall, trying to remove the baking sheet full of hot grease without spilling it. 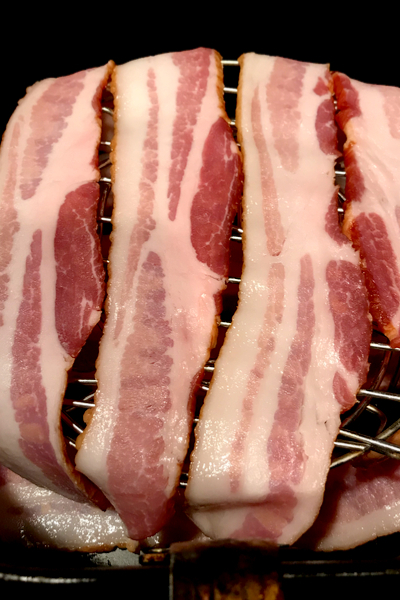 When we want to cook more bacon at once we use the our Instant Pot Tall Trivet. So what are the advantages of cooking bacon in the air fryer? First of all, it is in a closed cooking system so there is no risk of grease splattering out and burning you. Second, there is no need to pre-heat the oven. 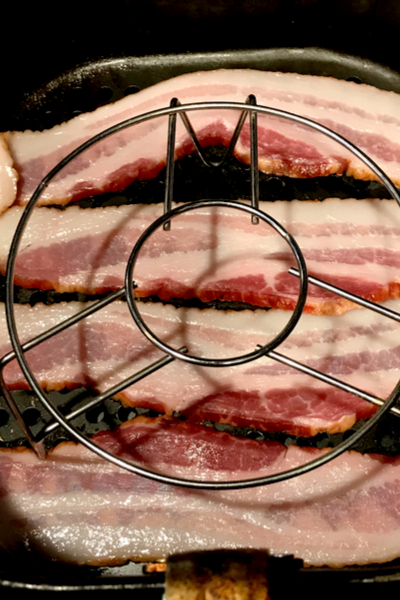 Place another layer of bacon on the trivet. 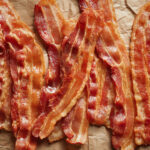 In fact, depending on the type of oven you have, your bacon can actually be cooked faster than your oven can pre-heat. And finally, your bacon grease will drain into the bottom of the air fryer. That means your bacon will crisp up nicely and not be soaked in grease. But there is one disadvantage of making bacon in the air fryer when compared to the oven method. You must cook the bacon in batches like you do in a skillet. Most air fryers aren’t large enough to hold an entire package of bacon. The bacon has cooked perfectly. As with all cooking devices, the way that air fryers cook will depend on your brand and size. I have found that for our BCP 5.5 quart air fryer that cooking the bacon at 390°F produces the best results. For pre-packaged, thick bacon slices, 9-10 minutes of cooking time is required. Of course, if you purchase standard bacon or extremely thick bacon from your butcher, the cooking time will need to be adjusted. Once you decide what works best for your air fryer, the only thing left to do is flip the bacon half at the half way point. The grease will drain below the basket. Because the grease drains below the cooking surface, there is no need to drain it on a paper towel before serving. Just pull it out of the air fryer and serve! Check out some of our other favorite Air Fryer Recipes. Preheat air fryer to 390°F. Skip this step if your air fryer does not require preheating. Line bacon in the basket of the air fryer in a single layer. Cook for 10 minutes, flipping at the halfway point. Cook for additional time if desired. *All Air Fryers cook differently. Adjust cook time based on your air fryer model. The thickness of bacon will determine length of cook time. 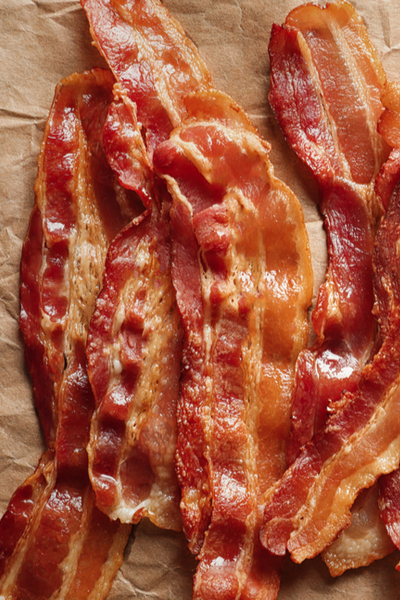 Thinner bacon will cook faster than thick bacon.